The day our son was born turned out to be quite a nightmare. We had no idea that he had a serious heart defect and a plethora of other problems. The medical staff also wasn’t prepared. There were no specialists on hand, so no one was ready when the little guy turned blue and stopped crying. Later, a man I’d never seen before entered my room with my husband in tow. Standing at the foot of my bed, Dr. Sushant explained that Children’s Hospital had sent a mobile ICU to transport Jacob to a better-equipped hospital. He explained dreadful things about my child, speaking softly but in a positive and upbeat manner with a smile on his lips. 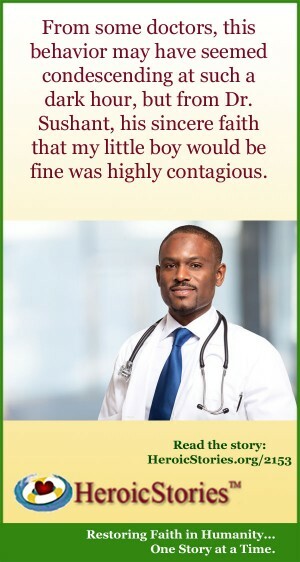 From some doctors, this behavior may have seemed condescending at such a dark hour, but from Dr. Sushant, his sincere faith that my little boy would be fine was highly contagious. When he said something, I just believed it. I later learned that Dr. Sushant had been the hospital’s on-call pediatrician when Jacob was born. It was because of him that my son survived. Then he spent the day at the hospital out of concern for a mother who was being separated from her very sick infant. He visited me twice a day because he was calling Jacob’s hospital up to four times a day, and he wanted to come and tell me in person what the doctors were telling him. He drew pictures of Jacob’s heart to explain what was going on and how it would be corrected. The nurses said he loved our family and he didn’t want me to be scared. These days, it’s rare to find a doctor who remembers a face from one visit to the next. For months Dr. Sushant saw Jacob every two weeks. He kept in constant contact with Jacob’s other doctors. He came to Jacob’s parties, even showing off Jacob to his sweet wife. His billing office was instructed to write off any amount that wasn’t paid by insurance. He once went so far as to offer to put us up in his home when we were worried about losing our home to medical bills. He was laughing at the time, but I don’t think he was kidding. Dr. Sushant is a wonderful person, one whose every move is fueled by love. It is truly amazing for a doctor to act in this manner today. Most often, if you get to see one at all, they just rush you in and out. This gives me hope that, maybe, the medical profession is turning around. Thank you Obama. People do not lose their home now due to medical bills. Thank God for people like Dr. Sushant. What a gift and a blessing he was to this family. May we all be comforted by such empathetic, compassionate and serviceful people in our hour of need. This is a reminder that there are good people everywhere. We would not know that from the media, but the good people are out there. And having a good man as a doctor – I know there must be many of them who want to help their patients. Thank you for this story. I am an RN of 49 yrs. and I can bet this wonderful physician is not American born. I have worked in NYC at world renown hospials, and in my experience, the kindest docs were NOT American born, but came over to better their training for residencies and post graduate fellowships in their specialties. That is a sad indictment, isn’t it…I realize it is a small sample in my own experience, but it does point to a trend. During the ’60’s, many young American men of some means went to college, post grad school, etc to avoid going to Viet Nam. What a great time to be a woman…and the goal of becoming a doc was wealth, prestige, and not so much getting close to the patients. There was little in med school to address emotional needs of patients and doctors. My late father was a doctor as were many friends and family members. Foreign born docs have a different experience with national health services, and making less $$$ than their American counterparts. Thank heaven for this wonderful doc who cared for his patient and patient’s parents emotional needs by keeping them informed re : their baby’s status. Having a kind caring and knowledgeable physician is the best!! Wouldn’t it be wonderful if all doctors were like Dr. Sushant? Bless him!